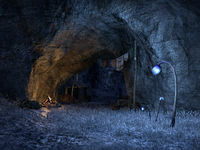 Cadwell's Hovel is located south of the Hollow City in southern Coldharbour. It is where you enter Coldharbour as part of the Main Quest. If you return to the portal location, you will be able to travel back to your Alliance Capital.